Only 8 sqm but this gypsies vagon or shepherd's hut can make you dream away, specially now that summer started and we want to spend as much as possible time in the garden. Our little summer retreat. The gypsies travel around with the vagon from place to place, making a stop where they can find work for the week, month or season. Their colorful life can inspire us for a bohemian interior. 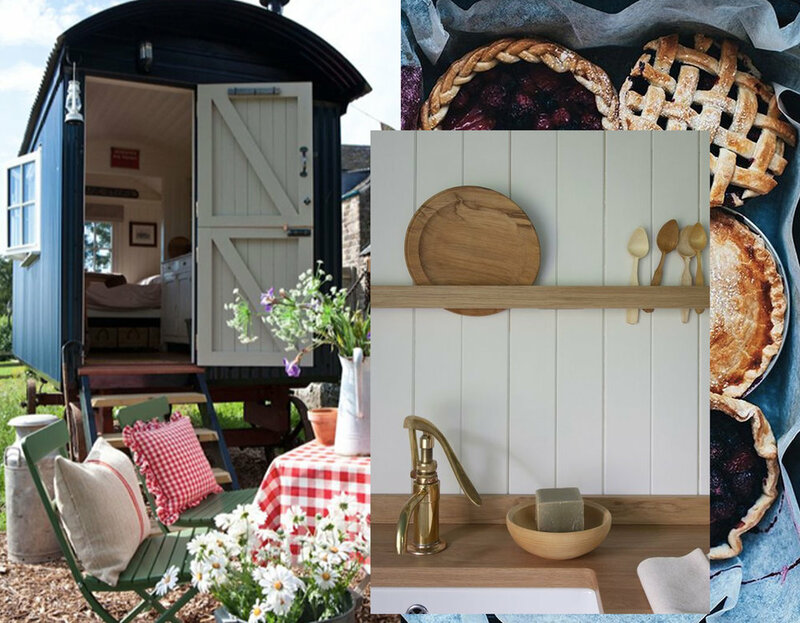 A classical shepherd's hut is 2 by 4 m, very small but you will be surprised that with a good layout you can make this space into your special summer place. Having guests over and no extra room? You can't surprise them more than having this special place prepared for them. Or your private space, escaping form daily life and finding time for your hobbies. Once you start planning you will be surprised how much can enter this small space. The 2 meters width is just perfect to host a bed, or bunkbed in case more guest stay over. Even a small bathroom can be provided. It is all about making a good floor plan before starting. These days you find a lot of products specially for small spaces. Don't just buy that washbasin or toilet, check the dimensions, 5 cm will make a world of difference. Such a place can bring up child memories. Well chosen pieces of decoration, or even DIY accessories will make this place look better than any countryside bed & breakfast. Use light colors to paint the wood work, as the space is small you want to make it look as big as possible. Use accent colors for the decoration you would be maybe afraid of using in the home. You can add a lot of color, mix patterns, it will never be to much. You can't over decorate, it will have a special charme. In this small space you can add more joy and humor than you would do in your home. Be honest, you want to stay there in the weekends and feel as going on holiday. For the romantic souls under us: who wouldn't dream of having a gypsy vagon in the garden. No restriction, just a place for you to decorate: white line, lace and a crystal chandelier. The place where you can do macrame, crochet or read in your armchair next to the window with a cup of tea. Time to relax, take out the old fashioned typewriter and start to write your novel, poetry, or make your journal. This is your space, you will see you will loose track of time. Summer is the time to be just who you are. No restrictions, live your dreams. Summer is time for easy lunches and dinner, time just to enjoy some simple food and a glass of wine with friends. You can prepare the meal in advance in your kitchen and do the last preparations in your summer kitchen. Install a little kitchen, a small fridge and sink and you are all set up to enjoy this season. As a child spending the summers at the sea side, you must have seen those small beach houses. Maybe you didn't had one and was always wondering what was inside of them: just storage or was their a whole world hidden inside of them. The sun can be to hot, coming out of the sea can be to cold, the beach house will offer shelter. Summer is a season you realize you can do which much less. A small bench to sit on when taking off the shoes, some beautiful woven baskets, a stool, some cloth hangers and you are done. Use the materials which are around, you can bring some branches with after a walk in the dunes. Summer is a time to relax and entertain. Blue and white are perfect beach colors, get inspired by the designs of the stones, the ripples of the water. What would you like to do if you would have such a retreat? For me it would my creative corner to paint and write a book.